When curator Antonia Marsh launched her gallery Soft Opening last year, she disrupted the way we traditionally think of exhibition spaces. Located in London’s Piccadilly Circus underground station, Soft Opening takes over a length of windows in the station’s round concourse, forming a vitrine that tube travellers can either stop to admire or glance at while passing through. A new artist has exhibited in this open-to-all space each month for the past year – the roster of names includes Rosie Marks, Claire Barrow, Dozie Kanu and Ryan McGinley. One year later, and Soft Opening round two has opened in Bethnal Green: in addition to the Piccadilly Circus space, a gallery – with opening hours, and that people can walk into – is now open on Herald Street. Its inaugural exhibition, Heartache, focuses on the Paris-based, Poland-born artist Agata Ingarden, whose sculptures and installations are industrial in both appearance and form. Wooden, glass and metal pieces are mounted on the walls in both iterations of Soft Opening, while sculptures crafted from metal pipes stand “making a mess”, as Marsh puts it, thanks to their viscous caramel coating, which drips onto the floor. 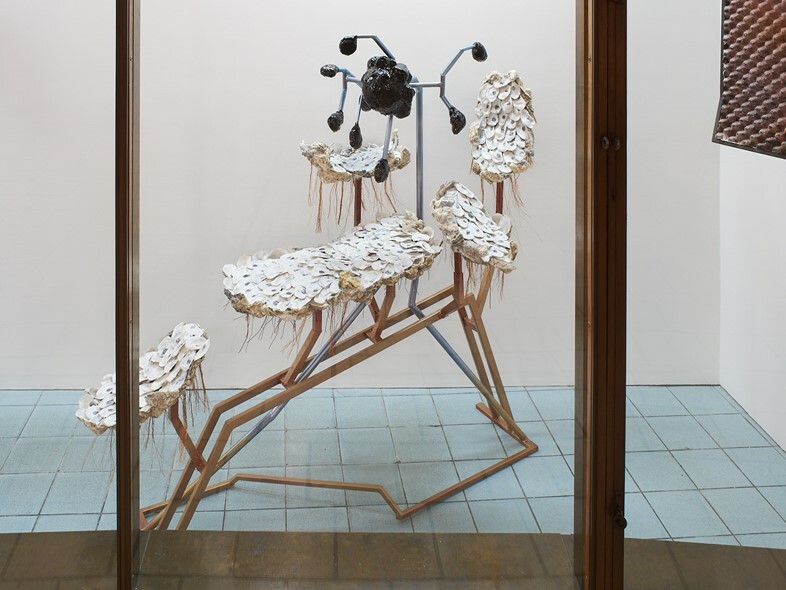 Ingarden’s practice is informed by things she came across on construction sites, giving her pieces a mechanic and machine-like quality that is somewhat disrupted by their unusual shapes, gelatinous coverings, and the introduction of natural materials like oyster shells and butterfly wings. In this way, she juxtaposes the manmade and the natural through her lively work. See more of Ingarden’s work in the gallery below, and catch Heartache in person at Soft Opening Herald Street and Piccadilly Circus. Heartache: Agata Ingarden is at Soft Opening until February 17, 2019.